Just in the process of swapping out the hubs of my trailer (square axle, nothing fancy) for 5 pin hubs compatible for my 16"Subaru rims. As you can probably tell already, i've very little experience with this sort of thing.. Are all 5 pin hubs the same? I'm guessing not..
Basically, is this an easy thing to accomplish? Mechanically wise I've got no problems doing it, the hubs come off the trailer easily and I appreciate that offset could play a part. It's more the sourcing of the hub, are they readily available or am I better off finding compatible hubs from a wrecker and cleaning them up? I have done this, you will need to check the offset of your existing wheels vs the Subaru ones. 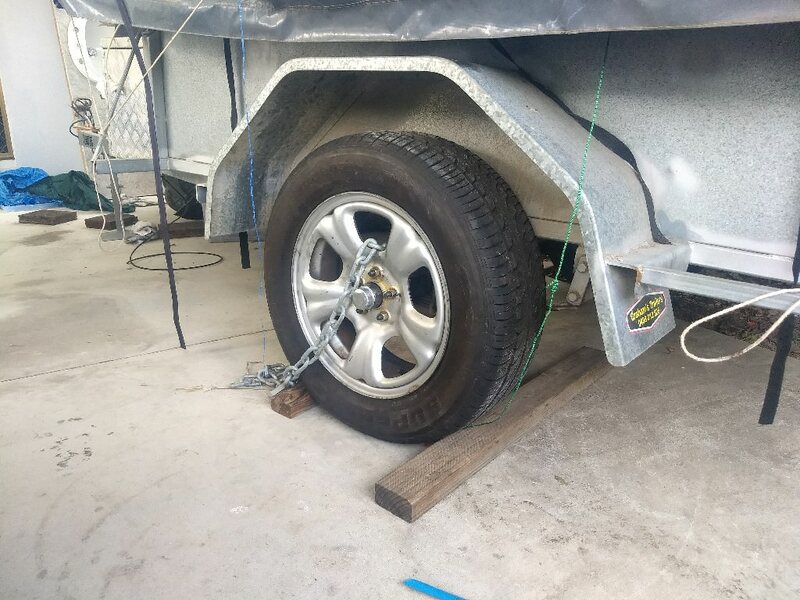 You need to ensure that the distance between the hub face and the trailer is larger then the distance from the back of the mounting face of the wheel to the rear edge of the tire -- does that make sense? The bearings and seals now become an question if you are buying locally - order the stud pattern (it will take a couple of days) and then take your existing hub in and show them the bearings they will match and press in the bearings while you wait (at least the bloke in Perth does). If ordering online you will need to work out what bearings you have if it is a 45mm square axle it probably has "ford" bearings if it is 40mm it is probably "Holden" bearings. I am fairly sure the hub should take either type so if you get it wrong you can knock out the old and in with the new. You should check with the supplier that the hub can take either bearing set if you are not going to show a sample. If the hub wont take both bearing types you will have to pull out the calipers and start measuring shaft diameters etc to get to right. Thanks for all the info, just got back from the local trailer place and have a couple of 5 x 100 hubs on order. $60 each though, hopefully includes bearings..! It's still going to work out slightly cheaper than buying three new tyres for the old rims, except for the purchase of the spare (which will match the car - I've got two almost brand new tyres to go on already. I'm also hoping that I'll be able to use second hand wheelnuts from the wreckers. will find out in a week! Total cost of bits including rims & 1 new A/T tyre is going to be about $450. This way I end up with a spare on the trailer that I can use on the car, and will include in my wheel rotations, rotating all six. Ben, I went into a lot of detail about all aspects of this in my trailer build thread (link in signature block). Might be worth a read for you. I can see the next thing I encounter is going to be to do with wheel nuts. Unless I can't get the wheels on because of axle length..
edit: My that trailer of yours had a transformation! Oh, that price also included the fitting of an Austrack 12 Camper Trailer Tent on top. I reckon I got a bargain, cnosidering my location. Unfortunately, the guy who built it has been locked up I think - he's vanished off the face of the planet, Hopefully he's Ok, bloody brilliant welder. Will put it all back together over the weekend. 'Then some time around Christmas I'll start building the new "Tent" to replace the current one. Anybody interested in a camper trailer tent for Christmas? 12' (bloody massive) with Awning & awning walls. $2599 new will sell for $1300, but you've gotta pick it up! Unfortunately, the trailers now lower by about 50mm. If I hadn't put the lift in the car, they'd be level..
Once I do the conversion on the trailer, I'll put the same size trees as I have on the car on it. Then if it looks too uneven, I might lift the trailer slightly.